Halloween in Miami, Roberto Cavalli Style! 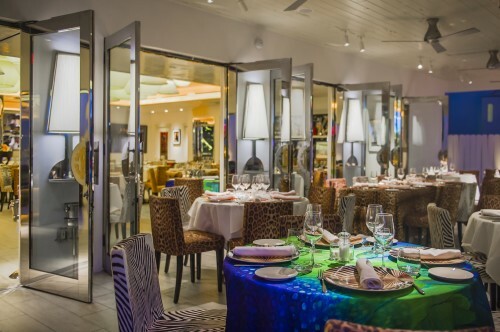 World-renowned fashion designer, Roberto Cavalli’s eye for fashion translates directly to his two-story, villa-style South Beach restaurant & lounge, Cavalli Miami, a place with a luxurious taste for food and design. 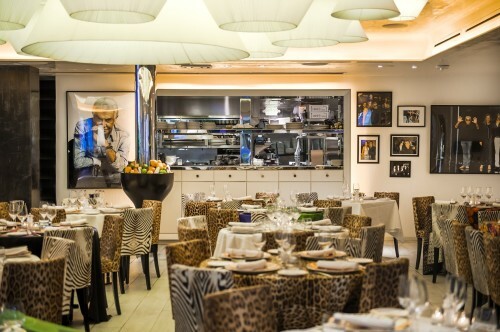 The space is donned in his signature exotic animal prints and distinctive florals, with classy mirrored accents and larger than life photographs of Cavalli line the walls as a career tribute celebrating his last 35 years in fashion. 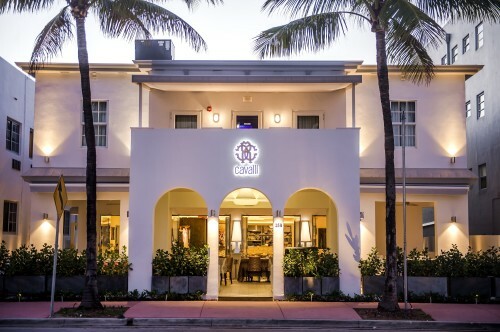 This high-profile venue was designed to “entertain” starting with the authentic Italian menu created by Executive Chef Stefano Mazzi, inspired by traditional family recipes from Italy. The pastas are made using Mazzi’s grandmother’s recipe: fresh eggs, flour, and a rolling pin. The menu is à la carte style, made from the freshest seasonal ingredients to enhance the typical Italian flavors with Tuscan influences and a touch of innovative gourmet. The starter menu offers traditional Italian dishes including handmade Gnocci, Crab Ravioli, Tagliolini with Lamb Ragu and Black Truffle Risotto. Some of the main dishes featured are Seared Tuna, Pan Roasted Chilean Seabass and Lamb Ossobuco. The elegant mise en place does the rest, the refined details and rich printed fabrics turn every meal into an opulence that appeals to all five senses. JUNGLE FEVER will come to Miami on Halloween! 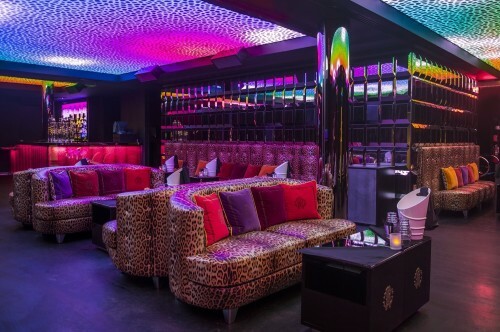 CAVALLI MIAMI has partnered with Brandcollective to create a jungle-themed Halloween paradise. Both the outdoor and indoor spaces will be fully decorated to reflect the wild jungle featuring live exotic animals, live act entertainment, open bar specials and gift bags. The venue will feature two different DJs, one downstairs and one upstairs with open format music inside the lounge where sweet treats will be passed throughout the evening. -From 9.00 Royal Dinner Buffet downstairs. Make sure and enjoy a night of fun, adventure and Style with Roberto Cavalli! This is a gorgeous place. A bit out of my price range sadly but I enjoyed your photos. Wow! THis looks like fun! Great looking hotel! That is something different to do and it saves you the work of throwing a party. It’s a bit expensive, but, with an open bar, maybe not so much! Quite a unique place. I would love to see inside for myself. I bet it’s a good time. The menu sound delicious. I’d love to try the Black Truffle Risotto or the Crab Ravioli. Loving the decor! I live in Tampa and would love to drive down to Miami and spend Halloween at such a lovely place! 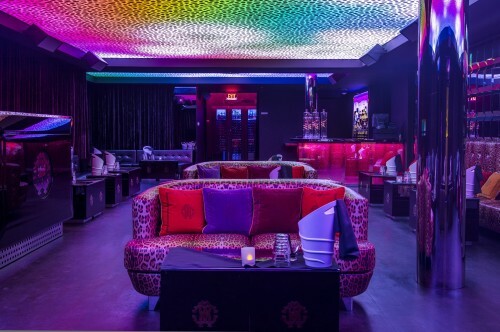 This looks like a fun posh posh kinda place. Not quite my cup of tea but definitely grabs your eye. 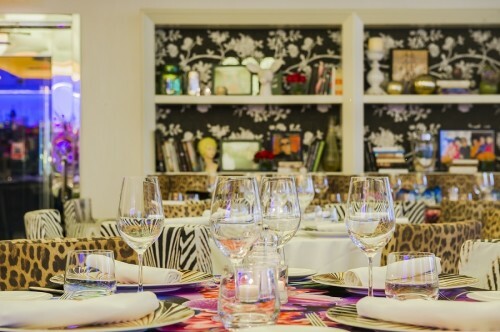 THis looks like a beautiful and elegant place to dine with marvelous food. I wish I could go there some day. Looks like a beautiful, fun place and the food sounds delicious! I have been to Florida, but not Miami. I would LOVE to visit this fabulous place!! It has style, it has flair, it has colors!!! Mazzi’s grandmother’s pasta recipe was the same one my grandma used over 75 years ago! Her Italian cooking was always fresh, home made, and delicious!! I am Italian – my maiden name really gives it away. My husband & I went to Venice & we ordered pizza. It is nothing like the pizza here in America. I’ve never had the Pan Roasted Chilean Seabass. I would love to try it. Thanks for the review of this restaurant!! this place looks like alot of fun! very colorful! i’ve only been down to orlando. I bet miami feels like a whole different place..! looks cool and fun! and at that cost I bet it’s great! This seems like a super awsome place! Cant wait to have dinner on Halloween night! um. This is pretty awesome. But then again, I’ve heard Miami is a pretty awesome place in general. This sounds wild! At over $100 per person, it better be stinking awesome! I love the wild jungle theme. It looks like a great party venue.